Those of you who follow the ICH blog know that we are often uploading information and interviews to the ICH Inventory on Memorial University's Digital Archives Initiative. It is an amazing resource for people conducting historical and folklore research, and the ICH Inventory is only one small part of the entire collection. There is a recent uploads page for the DAI, which showcases some of the more recent items uploaded. 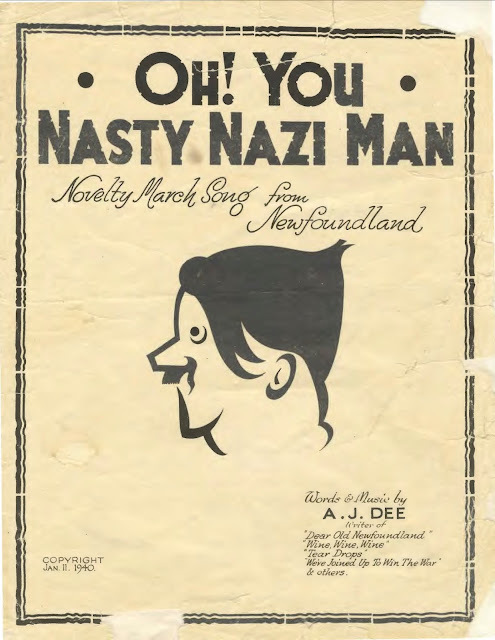 While checking it out today, I came across this peculiar gem, a novelty march song from Newfoundland entitled "Oh! You Nasty Nazi Man" - a call-to-arms of sorts with a chorus that starts "Oh! you nasty Nazi man, Way over in Berlin, You know you haven't got a chance, This blinking war to win." Words and music are attributed to A.J. Dee, and copyright is attributed to one A.S. Donnelly, of 20 McKay Street, St. John's. If you know anything about this piece of music, or the author, let me know, or leave a comment below! You can view the sheet music on the DAI, or download a pdf here.